Karl Fuchs joined iDirect Government Technologies (iGT) in 2004 as the Director of Engineering, just as the satellite-based IP communications company was expanding its very small aperture satellite (VSAT) market presence into the federal government and international Internet Protocol (IP) networking world. He now works as the Vice President of Engineering. As Vice President of Engineering, Fuchs leads iGTs team of federal systems engineers and serves as chief architect for new product integration. Fuchs has more than 20 years of experience in the areas of technology and the federal government. Prior to joining iGT, Fuchs was Director of Systems Engineering at Nortel Networks, where he oversaw the Verizon account team of systems engineers, leading the design of IP, Frame Relay, Asynchronous Transfer Mode (ATM) and dense wavelength division multiplexing (DWDM) networks. Before joining Nortel, he designed IP and ATM networks for Sprint and the federal government. How did iGT become involved in the JUICE project? In spring of 2004, iDirect Government Technologies (iGT) was asked by the Missouri National Guard to participate in the Joint User Interoperability Communications Exercise (JUICE). At the time, iGT had been working with the Missouri National Guard and the National Guard Bureau. The Missouri National Guard needed a way to demonstrate Non-classified Internet Protocol Router Network (NIPRNet) access for the National Guard and Internet access for first responders who also were participating in the exercise. iGT was the first Very Small Aperture Terminal (VSAT) provider to offer Virtual Local Area Network (VLAN) support on its remotes, allowing for access to both networks on a single platform. Every year since, iGT has demonstrated new, cutting-edge technologies including Communications on the Move (COTM), Transmission Security (TRANSEC), geographic hub redundancy and more innovations at annual JUICE events. How can iGT leverage what was learned during JUICE to fortify their offerings in the MILSATCOM arena? 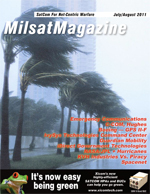 What are iGTs initial thoughts regarding what they can do to improve MILSATCOM? At JUICE 2010, iGT Evolution SATCOM equipment and engineering support was used to provide joint communications interoperability to U.S. military organizations in eight states as well as Ramstein, Germany. Additionally, Secret Internet Protocol Router Network (SIPRNet) connectivity between JUICE and the Coalition Warrior Interoperability Demonstration (CWID) was successfully implemented; a first. Numerous VTC sessions were conducted between four participants; two On the Move (OTM) vehicles, the JUICE Joint NETOPS Control Center (JNCC) and Joint Interoperability Test Commands (JITCs) Indian Head, Maryland, test bed. The OTM vehicles were driven in the vicinity of Fort Monmouth, New Jersey, supporting JUICE, and in Dahlgren, Virginia, supporting CWID. 5th CCG, also acting as the Air Force Forward Element (AFFOR), accomplished these objectives over the iGT JUICE 2010 TDMA SATCOM NIPRNet with SIPRNet tunneled and TRANSEC enabled. The iGT modem-based terminals operated from Bethany, Deleware; Savannah, Georgia; Tinker and Robins Air Force Bases; and Fort Monmouth, New Jersey. iGT is also helping to improve MILSATCOM, by enabling soldiers to receive battlefield imagery that identifies potential enemy threats, and transmit situational video to back to base. We also receive command and control information and even transmit X-rays and imagery of a wounded soldier to doctors who can interpret the injury and provide guidance on proper treatment. Will the Warfighter actually experience some immediate benefits from the lessons learned at JUICE, or are these conclusions only applicable to future offerings? Our participation in JUICE has always included products and solutions that are readily available. For example, in this years exercise, the COTM demonstrations and solutions would solve immediate needs of soldiers and commanders in current conflict. Our own engineers benefit greatly from participating in the JUICE exercises as they gain a greater appreciation for how soldiers in the field actually use the equipment, and by understanding the challenges they face. As an example, this kind of shoulder-to-shoulder experience gathering has lead us to understand the difficulties a soldier faces with crypto key management. This lead us to develop our TRANSEC with a National Security Agency (NSA) approved internal key generation and software key distribution mechanism. One problem has always been the timeline between exercises and viable, produced product... can iGT improve on this and bring into play product that will actually be useful in a shorter time period? If so, how? SATCOM OTM provides real-time situation awareness and, therefore, better command and control decisions in non-line-of-site (NLOS) scenarios. As configured and demonstrated during JUICE, the OTM systems are easily certifiable for Approval to Operate (ATO) and immediate deployment. One vehicle even used the same model L-3 Communications OTM antenna that is under consideration by several large programs. Information Assurance policy and procedures were followed and documented and only devices listed on the Approved Products List (APL) were used, including KG-250 Type-1 encryption for SIPRNet. In addition, JITC participated in the JUICE OTM VTC sessions. Another JUICE objective was to demonstrate ultra portability. U.S. Marines participating in CWID and 112th Signal Battalion (AB) paratroopers successfully joined the JUICE SIPRNet VTC sessions using an iGT Evolution-based L-3 Panther, a ~30 lb. SATCOM terminal that fits in a rucksack. Readily available products and technology used by iGT at JUICE means faster deployment to the warfighter. iGT platforms provide support for battlefield and milsat applications today and will continue to evolve to meet the needs of future applications. To the military and government users of COTM, the implementation of technology can be a highly frustrating process... are there any methods iGT can use to help assuage such implementations through additional training, product cycle reviews, and in-field activation of systems? The birth of the COTM market has seen its frustrations as the introduction of any new technology does. In the COTM space, the most difficult challenge has been the integration of the tracking antennas and the remote modems. iGT has taken a few years and countless trials and demos to work out the kinks between the modem and antenna manufactures. We are working through similar challenges in the airborne COTM space. Airborne COTM is inherently more complex, given both the modem and the auto tracking antennas require input from the aircraft navigational systems. Now, all three must work together. I believe the best way to speed development and ease the transitional pain of adopting these new technologies is through better communication and integration between the antenna and modem manufacturers. This is one area where the DoD may be able to help. I have been to many productive DoD industry conferences, and one or more focusing in on development strategies for airborne COTM could be very useful. Boots on the ground and bullets in the air tend to cause the Warfighter to become less-than-patient with third-party solutions that possess huge potential but take forever to bring into play. Can iGT do anything to influence decision-makers in regard to ensuring effective product plays its powerful role on the battlefield within short order? iGT is constantly working with the government and integrators to bring the best communications solution to the field as quickly as possible. We face many of the same challenges all other technology manufactures face including procurement complexities. I believe one of the most effective methods to bring relevant technology to the battlefield quickly is to simplify requirements and focus on what the warfighter really needs and let industry develop the best solution set. Karl, what elements in your background make you the ideal spokesperson for your company and the warfighter? I have more than 20 years of industry experience in designing both terrestrial and satellite networks and products. The majority of my career has been dedicated to working in private industry along side of the Department of Defense (DoD) to provide robust, communications solutions. My product development role as Vice President of Engineering, coupled with my close relationship with DoD end-users as well as integrators, allows me to understand and articulate all sides of the technology development and insertion equation and provide solutions to the warfighter.